For use in large Drain Lines in Factories, Food Processing Plants and institutions. Directions for use: The quantity to be used will depend upon the diameter and length of the pipeline and the nature of the obstruction. The following will serve as a general guide. Pipe diameter: Amount of DRAIN CLEAR CRYSTALS per 150 metres of length. Up to 10cm 2.5 - 7.5kg 10cm to 20cm 10.0 - 20.0kg 20cm to 30cm 25.0 - 50.0kg 30cm to 45cm 50.0 - 100kg above 45cm 100.0 - 125kg As a starting point, use about 10kgs of DRAIN CLEAR CRYSTALS, introducing it in 2 or 3 increments. If possible, block the pipe somewhere beyond the obstruction to allow the chemical action to work on the obstruction for as long as possible. Allow about 30 minutes reaction time. Repeat application, if necessary. When line is free flowing, flush with cold water. Introduce DRAINO CRYSTALS into the line periodically, thereafter, to prevent stoppages from occurring. 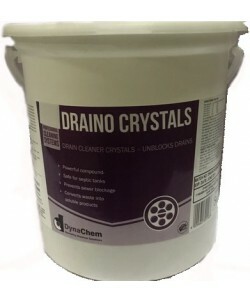 Small drain lines in sinks restrooms, tubs and grease traps; ad 10 to 40g DRAINO CRYSTALS into the drain. Allow 30 minutes for the product to work into react with the obstruction.